The Zero Gravity Research Facility is NASA’s premier facility for ground based microgravity research, and the largest facility of its kind in the world. 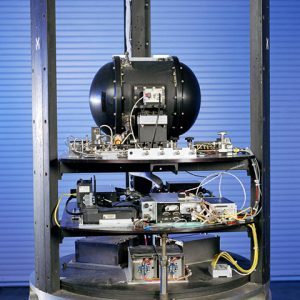 It provides researchers with a near weightless environment for a duration of 5.18 seconds. The Zero Gravity Research Facility is NASA’s premier facility for ground based microgravity research, and the largest facility of its kind in the world. The Zero-G facility is one of two drop towers located at the NASA site in Brook Park, Ohio. The Zero-G facility has been operational since 1966. It was originally designed and built during the space race era of the 1960s to support research and development of space flight components and fluid systems, in a weightless or microgravity environment. 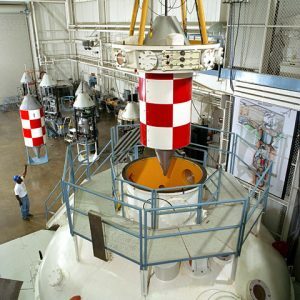 The facility is currently used by NASA funded researchers from around the world to study the effects of microgravity on physical phenomena such as combustion and fluid physics, to develop and demonstrate new technology for future space missions, and to develop and test experiment hardware designed for flight aboard the International Space Station or future spacecraft. The Zero-G facility provides researchers with a near weightless or microgravity environment for a duration of 5.18 seconds. Microgravity, which is the condition of relative near weightlessness, can only be achieved on Earth by putting an object in a state of free fall. NASA conducts microgravity experiments on earth using drops towers and aircraft flying parabolic trajectories. Allowing the experiment hardware to free fall a distance of 432 feet (132 m) creates the microgravity environment at the Zero-G facility. The free fall is conducted inside of a 467 foot (142 m) long steel vacuum chamber. The chamber is 20 ft (6.1 m) in diameter and resides inside of a 28.5 ft (8.7 m) diameter concrete lined shaft, which extends 510 feet (155 m) below ground level. A 5 stage vacuum pumping process is used to reduce the pressure in the chamber to a pressure of 0.05 torr (760 torr = standard atmospheric pressure). 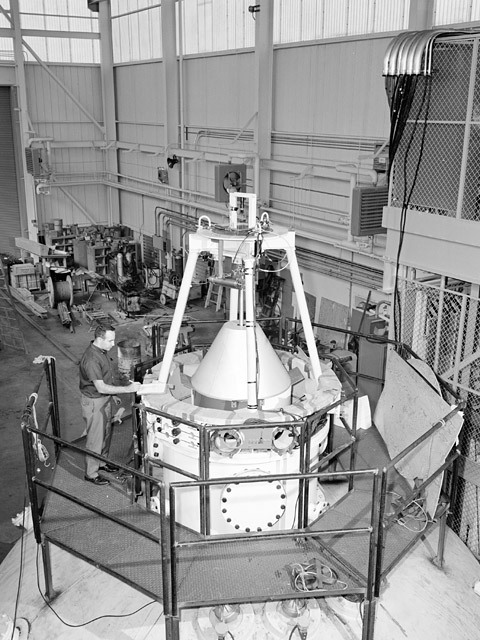 Evacuating the chamber to this pressure reduces the aerodynamic drag on the freely falling experiment vehicle to less than 0.00001 g. To prepare for a drop, an overhead crane is used to position the experiment vehicle and release mechanism at the top of the vacuum chamber. 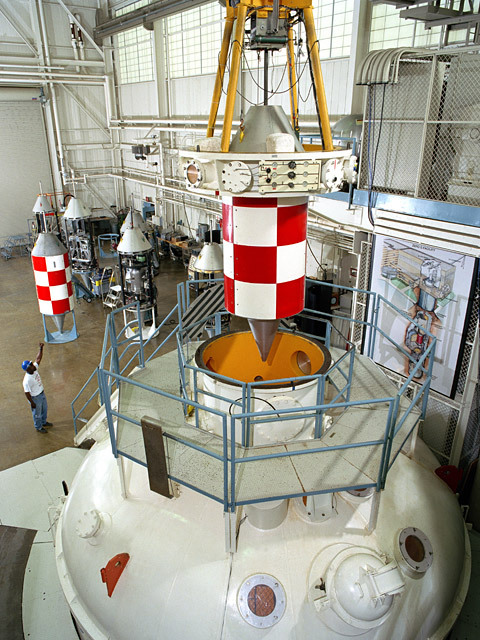 Once in position, the drop vehicle is connected to the facility control room via an umbilical cable. This cable allows the experiment to be monitored and controlled from the control room until the release sequence is initialized. 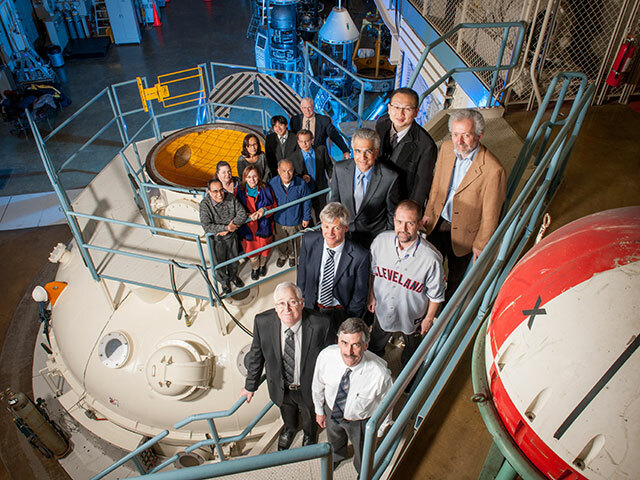 It takes approximately one hour to evacuate the vacuum chamber. Once the chamber is evacuated the release sequence is initiated. Remotely fracturing a specially designed bolt allows the experiment to begin its 132 meter free fall. 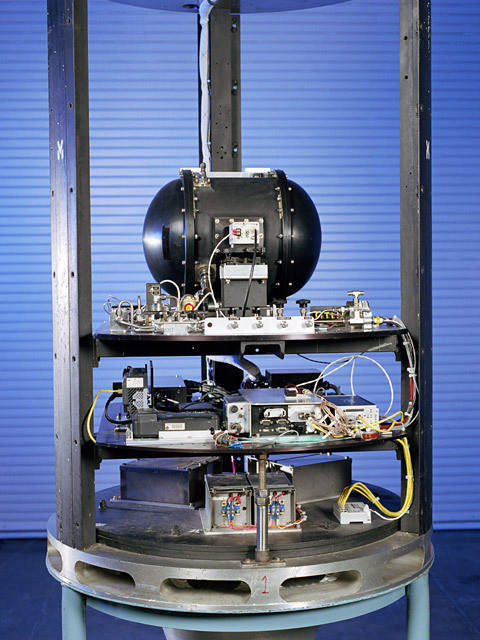 During the drop the experiment operates autonomously with all experiment power, data acquisition, and control functions located on the freely falling experiment vehicle. 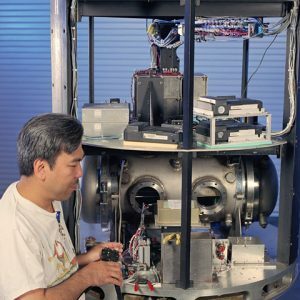 An electronics technician makes adjustments to the experiment on the ‘H’ drop vehicle at the Zero Gravity Research Facility. After falling for just over 5 seconds the experiment vehicle is stopped in the decelerator cart, located at the bottom of the chamber. The decelerator cart is 11 foot ( 3.3 m) in diameter and nearly 20 ft (6.1 m) deep. It is filled with 1/8” (3 mm) diameter expanded polystyrene beads. These beads dissipate the kinetic energy of the 2500 lb. 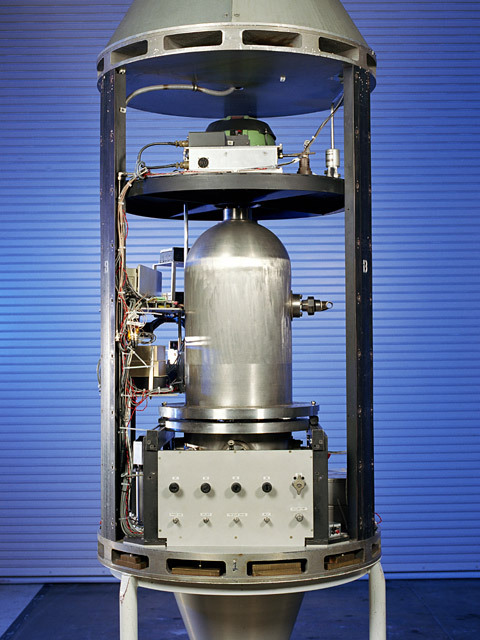 experiment vehicle, which is traveling at about 113 mph (50.5 m/s) when it enters the decelerator cart. The experiment vehicle is stopped in about 15 feet (4.6 m) of expanded polystyrene and experiences a peak deceleration rate approaching 65g. 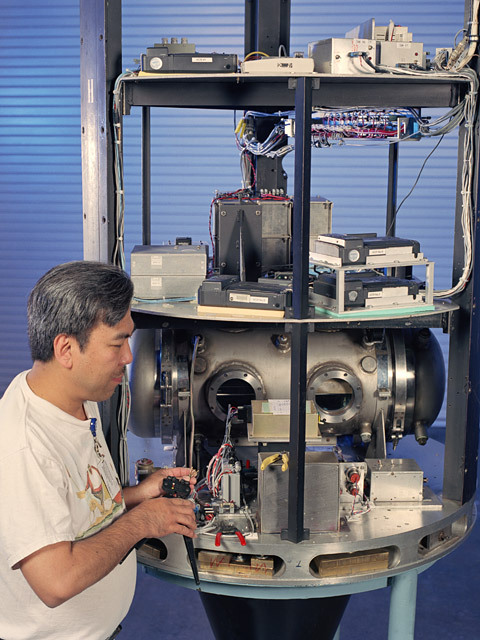 The experiment drop vehicle serves as a load bearing structure and protects the experiment hardware from the shock loads experienced during the deceleration. 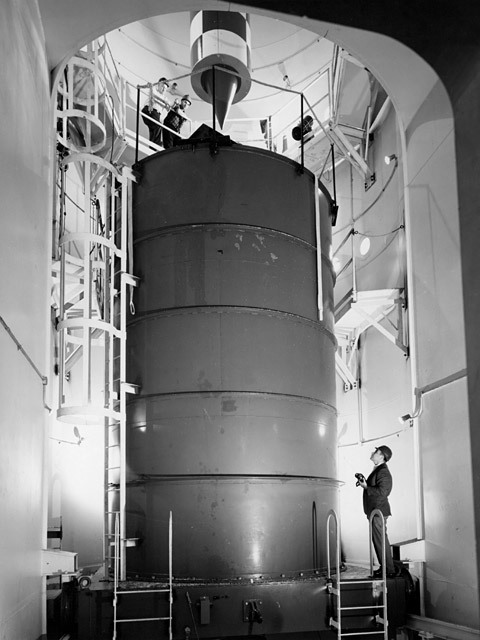 The typical drop vehicle used is cylindrical in shape. It is 42” in (1 m) diameter and has and overall length of 13 ft (4.0 m). The drop vehicle gross weight is limited to a maximum of 2500 lbs (1130 kg). Take a virtual tour of our Zero Gravity Research Facility. The Zero Gravity Research Facility provides a near weightless or microgravity environment for a duration of 5.18 seconds. This is accomplished by allowing the experiment vehicle to free fall, in a vacuum, a distance of 432 feet (132 m). 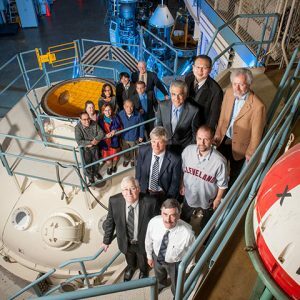 The facility can provide a microgravity test environment for a fraction of the cost conducting an experiment in space and provides the best gravity levels of any of NASA’s ground based low gravity facilities. Experimental Drop Vehicles used in the Zero-G Facility can accomodate payloads up to 1000 lbs (455 kg). The free fall is conducted inside of a 467 foot (142 m) long steel vacuum chamber. Chamber pressure is reduced to 0.05 torr (760 torr = standard atmospheric pressure). The Zero-G facility was originally designed and built during the space race era of the 1960s to support research and development of space flight components and fluid systems, in a weightless environment. Microgravity, which is the condition of relative near weightlessness, can only be achieved on Earth by putting an object in a state of free fall. NASA conducts microgravity experiments on earth using drops towers and aircraft flying parabolic trajectories. European Space Agency (ESA), NASA, Japan Aerospace Exploration Agency (JAXA), Pre-Coordination Meeting. 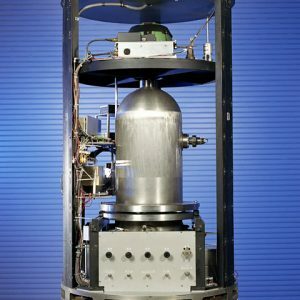 Drop Vehicle used in the Zero Gravity Research Facility. 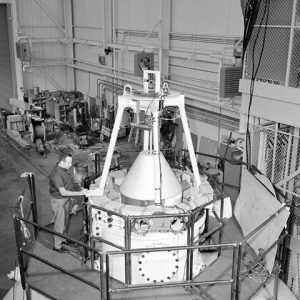 Effect of Electric Fields on Flames Experiment installed on “M” Drop Vehicle used in the Zero Gravity Research Facility. 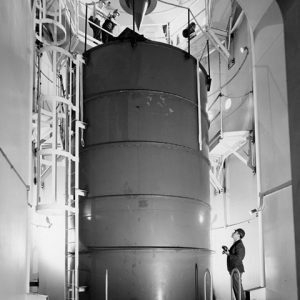 View of the decelerator at the bottom of the Zero Gravity Research Facility. First drop test in the Zero Gravity Research Facility.